I’ve long been a fan of modern architecture, even more so since I’ve been travelling and furthering my photography skills. Indeed, the highlight of my time in Chicago last October was an architecture boat tour, and I’m sure much of my travels around Europe in the next few weeks will be spent pointing my camera towards iconic buildings such as the Olympic Stadium in Munich, and the City of Art and Sciences in Valencia. Always eager to learn more about the discipline, this exhibition about Le Corbusier, a celebrated multi-disciplined practitioner and father of the International style of architecture seemed too good an opportunity to miss. The exhibition is divided into three parts. ‘Context’ charts his early influences and features his early designs for villas in Switzerland and France. ‘Privacy and Publicity’ explores his passion and advocacy of ‘type-objects’—lights, tables, chairs and other items for which he furnished his buildings or endorsed in his periodicals. The final section ‘Built Art’ is the largest of the three sections and perhaps where ‘The Art of Architecture’ is most evident. With many of his paintings, tapestries and sculptures on display, this section also features his later signature buildings such as the Unité d’Habitation in Marsilles, the Philips Pavilion for Expo 58 in Brussels, as well as his urban planning and architecture in Chandigarh, the capital of Punjab and Haryana in India. 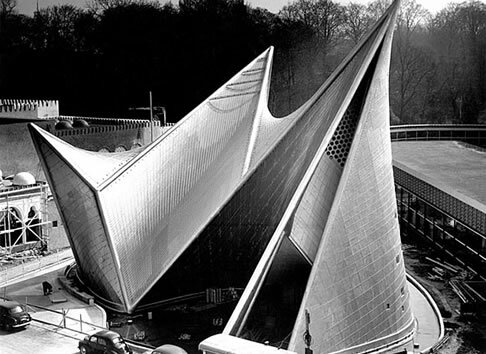 The Philips Pavilion at the 1958 World’s Fair in Brussels. The key story underlined throughout this exhibition, is that of his style and opinion changing and maturing as he got older, his designs becoming less rigid and more organic over time. With this in mind, I was left wondering what buildings he would have designed had he lived another 20 years or so. I can’t say I particularly liked a lot of Corbusier’s work, I’ve never been that excited by buildings designed using such rectangular and grid-like styles (although oddly when it comes to skyscrapers my opinion changes—the Aon Centre and IBM Building in Chicago are two of my favourites). However I do find myself immensely fascinated by the large scale urban planning and building projects here in Britain that were heavily influenced by his style. It’s no accident that this exhibition is housed in the Barbican Centre, as it and the surrounding estate, designed by Chamberlin, Powell and Bon in the early 1960’s owes a lot to Le Corbusier, as do similar sites such as Park Hill in Sheffield and Cumbernauld Town Centre. Yet aside from a small ‘resource room’, little attention was paid to these and other buildings influenced by his work. Rather it would seem the topics surrounding his influence are only available in the related talks and events. 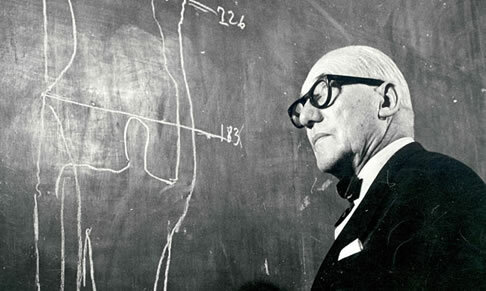 Le Corbusier, The Art of Architecture runs until May 24th. Architecture has never been kind to Birmingham, but then Birmingham has never been kind to its architecture.